Garden Fence Cleaners | Why Clean Wooden Fence Panels? A common issue with garden fence panels is the development of mould, algae, fungi or mildew. This is more common with garden fences situated in shaded or damp conditions and can eventually result in wood rot. So how do you protect fence panels and posts to keep them looking good and protected for longer? Why clean mould and algae from garden fence panels? In short, apart from looking unsightly, any type of biological growth that forms on the timber of wooden fence panels will eventually promote wood rot and decay, shortening the life of the panels and posts. Using a dedicated fungicidal wash or mould and mildew cleaner will not only remove the growth from the wood but will also kill the mould spores in the timber which will help to prevent re-growth. Once treated with a fungicidal wash or mould and mildew cleaner, fence panels and posts can be re-treated with a clear or coloured wood preservative, exterior wood oil or decking oil, or a combination of both. To protect new fence panels, treat with a good quality fence preserver and then an exterior wood oil or decking oil. This will give the best possible protection by protecting the timber from weathering and water ingress. This process is still recommended for panels and posts that have been pre-treated or tanalised to provide the best possible protection. 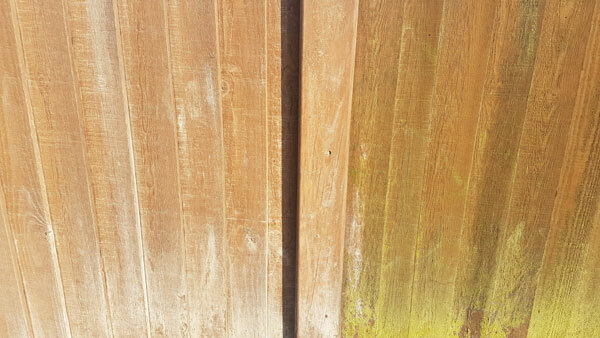 Old wooden fence panels and posts that have black or green areas should be treated with a Mould and Mildew cleaner. For garden fences that have a large surface build up of mould or algae, use a stiff brush, broom or scraper to remove as much surface matter as possible before treating. Heavily soiled fence panels may require a second treatment to fully remove any biological growth. Not sure which wood preservative or wood oil to use on garden fence panels and posts? See our guide on garden fence preservers and garden fence oils.